I love a well-written hiking memoir -- I've read about a dozen of them in the last decade, and this one is very good. 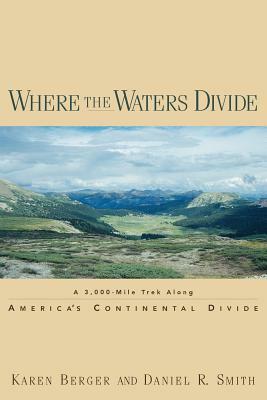 Karen Berger and her husband, Daniel Smith, set out to hike 3,000 miles along America's Continental Divide, traveling from the southern edge of New Mexico all the way north to the Canadian border. They suffer through the heat of the desert, fierce thunderstorms and snowstorms, and winds so strong it nearly blew them over. But what a way to see the country! At times the areas they were walking through were so remote and wild that you couldn't tell what century it was.One thing that sets this hiking memoir apart from the others is its historical references and anecdotes. The book is filled with interesting stories of the towns and regions they visited. "In other places, one travels to the cities to find history, to learn about what came before, to see the places where history is made. Not here. Because what, after all, is the history of the West? The West's story is found in the small towns and the big ranches and the empty spaces in between. It is found in the abandoned cabins and the rusting machinery and the forgotten projects of dreamers. The gold rushes, the ranches, the open range, the railroads, the mines, the emigrant trails, the logging camps, the old-time barrooms: There are stories in the weathered beams, in the rutted roads, in the broken fences. There are stories in the attempts to subdue a harsh land, to travel through it, to make it yield its wealth. "After a particularly brutal day of hiking through a rainstorm in Colorado, Karen wrote this: "It is said that the Inuit people who live in arctic climates have dozens of words for snow. Hikers, then, should have as many words for rain. We should have a word for warm rain, and a word for cold rain. We should have a word for the fat, swollen raindrops of a mercurial, quick thunderstorm, and a word for the needle-thin raindrops of an all-day downpour. We should have a word for rain that falls gently on a tent at night, when we are snug and dry in our sleeping bags, and we should have a word for the rain that arrives when we are in the middle of making camp with our gear strewn about on the ground. And we should have a word for the rain that fell on us at Carson: a cold, long, determined, all-day sort of rain with a few thunderstorms thrown in for good measure. "Another thing I loved about this memoir were the stories of the strangers who helped the couple along the way. Hikers call this "trail magic," meaning when something good and surprising helps them in their journey, such as being offered drinks, snacks or a ride to the nearest town. Almost everyone they met was impressed by their plan to walk from Mexico to Canada and wanted to help them in some small way. Karen and Daniel also got to hear lots of local stories and learned about the various environmental and political issues going on in each area. One final note about this journey is that it happened in the early 1990s, which is significant because it was pre-Internet. The couple had a difficult time planning the trip because there were very few guidebooks and available maps of the Continental Divide Trail -- they wrote dozens of letters to Forest Service ranger stations trying to get more info on the route so they could plan their stops and package pick-ups. Now we take the Internet for granted, so much so that it's easy to forget how challenging it was to find resources before everything was a few mouse clicks away.Update January 2014I am currently reading another hiking memoir and it reminded me of how good this one was, especially considering how much more difficult it was to plan such an endeavor in the pre-internet age. What an accomplishment! I'm planning my own 2013 CDT thru hike and am currently devouring maps and books like this. It is hard to believe that since 1993 , when this book was first published, thru- hiking this LONG trail was estimated to take 6-8 months. Now, hikers are making it in around 5 months. Better, lighter gear, and the knowledge that it can be done, are the reasons. Also it is much easier to obtain the maps and general information. The authors wrote hundreds of letters to rangers, supervisors, and forest service officers. No one does that anymore. So far, I have spent over $500 on maps, but only needed two addresses to get them, and I did it all over the Internet.If you don't want to spoil your read of the book stop here:The writing here is good. The suffering level is high. The authors didn't make it out of Montana at the northern end before the snows hit in October, and resorted to road walking the last several hundred miles before reaching the border on Nov. 2. There were no GPS devices to help them, as there are now. It is interesting that the same complaint they had throughout the book about poorly marked trail is the case now with present day hikers. There's not much data here about practical matters like the specific gear they had with them. They were hiking in heavy boots with thick socks, so blisters were a real issue. They prepared 80 boxes of food and supplies that were mailed to themselves at 30 resupply points. They tried to maintain a 15 mile a day average, even through Colorado, where the trail averages at 11,600' in elevation. Those guys were tough. The story of a 2850 mile backpacking trip along the Continental Divide trail is told by the least experienced member of the group. Her novice perspective on surviving lightning above 14,000 feet, blistering desert heat, scrambling up and down scree slopes, and becoming hopelessly lost without water makes this journey realistic, and even Sunday hikers will wonder at times whether to make a trip of their own. She describes the land beautifully, comparing and contrasting each of the four states through which the trail passes. The vignettes of people she meets, from hunters to Native Americans to fellow hikers, serve as a vehicle to slowly narrate the story of her own values and personality--environmentally oriented, open minded and curious. She loves the land as much as I do, and this is a great book for hikers who love scenery and are concerned about how environmental policy protects it (or not). The characters are presented in their own environmental contexts and she avoids, for the most part, labeling them "good" or "bad." While dated, this book provides an excellent look at the CDT as it was being formed in the late 80s. The writing is superb and the book moves along quickly. Few hiking "journal" books have such discussion of the legislative and jurisdictional aspects of the trail. The CDT, unlike the AT or PCT, struggles with the local landowners who are not happy with the federal jurisdiction of the trail. The residents near the CDT have not seen the financial windfall that the folks around the PCT and AT have. Thus, they are wary of any Washington agency flying in to buy land for the passing of pilgrims along the CDT. I enjoyed reading about this. I also enjoyed the author's description of the CDT as it passed through Yellowstone and Glacier NPs. Her discussion of permitting is one that I get frustrated with too sometimes. She expressed those feeling more exactly than I could. Read this one quickly, admittedly skimming over passages of historical significance on parts of the trail that I deemed uninteresting. I am much more fascinated by the planning and execution of a long-distance hike and hoped the authors would go more in depth with the tease they gave at the beginning of the book. Namely, exploring the relationship between a couple who spent the early years of their marriage in a long-distance relationship and were about to find out what life was like together (a challenge in itself under "normal" circumstances) with a host of challenges that hiking the Continental Divide would bring. Nonetheless, an enjoyable read. If you want to know what it's like to hike from Mexico to Canada long the Continental Divide Trail - then read this book. It is from the wife's perspective and it details the deserts of New Mexico to the Gila Mountains to Denver's Front Range, back to Wyoming's desert and then the Mountains in the Wind Rivers and the cold/wind/snow of Montana and the bears of Glacier National Park. She also tells about the history of many of their camping spots and what has taken place there previously - some of which was a little drawn out. Overall though, this was a fun book to read! I loved this book and found it highly inspiring that anyone would endeavor to hike from Mexico to Canada. Technology may make planning for this trip easier than it was back in the day....but at the end of the day you still have to put boots on the ground to make this incredible hike. I highly recommend this book if not for the inspiration alone. I am enjoying this immensely....a vicarious hike! Did I say HIKE? Much, much more than that. Karen Berger Daniel R. Smith - Librarian Note: There is more than one author in the GoodReads database with this name. See this thread for more information.Karen Berger, author of the best-selling Hiking and Backpacking: A Trailside Guide, has hiked over 15,000 miles, including the Appalachian Trail, the Pacific Crest Trail, and the Continental Divide Trail. Karen Berger is a pianist on the faculty of the Berkshire Music School in Pittsfield, Massachusetts. She was an editor of The Instrumentalist, Clavier, and Accent on Music magazines and received the Ed Press Distinguished Achievement Award. She s the author of eleven books, including seven how-to books. She wrote three titles in the best-selling Trailside Guide series, including Hiking and Backpacking, which has sold over 150,000 copies.